Review Article. 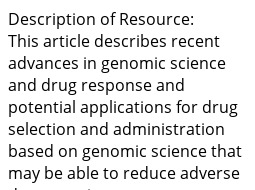 Describes recent advances in genomic science and drug response. Describes potential applications for drug selection and administration based on genomic science that may be able to reduce adverse drug reactions.